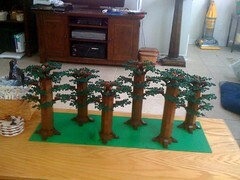 So today I finished building trees for Endor & Star Wars Celebration V... I'm actually up to 9 trees now. In my quest to find parts, I've been doing a little sorting & hunting for parts. In the process, I found my Dewback -- I'm excited. I plan to tackle the Tatooine landscape after finishing up with Endor's landscape. What I didn't now, the cheapest Dewbacks on Bricklink is $25. Holy Crap! If worse came to worse, I have an unopened #4501 -- the cheapest on Bricklink is $125. Holy Crap! Now I'm left with the dilemma, do I open the set for a 2nd Dewback or not? Wow, Mike, I don't know about the 4501, those sand tones must be really tempting... ;) Either way, great find!